At L&M we love our produce and take great pride in our farms. Each and every person on the farm understands their expertise and the importance of their individual role. It’s more than just planting a seed and watching it grow; there’s a whole team of people responsible for bringing it all together. From the people who prepare the land, to those who harvest the crops … all the way to the driver that delivers to your door, we all work together to bring you the very best our farms have to offer. Innovation: Farming is a great inspiration for innovation. L&M is always pursuing the latest in farming technology, equipment, irrigation, pest management and packaging to improve our effectiveness & efficiency, and reducing our outputs. Growth with a Purpose: L&M began farming 1973 and soon after expanded its farming presence up and down the East coast, carefully considering the overlap of growing seasons to ensure continuous availability of fresh vegetables. As our product offering expanded, so did the depth and breadth of our farm locations. L&M now farms in many of the major growing regions throughout the US. 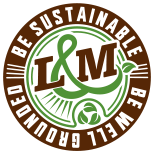 Sustainability: At L&M we’re committed to doing our part to protect the environment through water & energy conservation, reducing carbon emissions, utilizing integrated pest management, seeking environmentally friendly packaging opportunities, and making our warehouses and offices equipped with recycling bins and good energy practice reminders. Food safety: L&M is committed to supplying safe, high quality fresh fruits and vegetables to its customers. We fully accept our responsibility to meet or exceed our customers’ expectations, as well as all requirements of relevant food legislation and regulations. L&M is proud to partner with other family farms across the country and even outside of the US in Mexico and Central America. Our farming partnerships are vast and varied in size and location, yet we all have the same passion for fresh fruits and vegetables and the same goal of bringing our mutual customers the freshest, most delicious produce available. Everyone loves fresh produce from right down the road and we are no different. We love local! Our local partners vary from brand new vegetable growers to 4th generation top of the line farms like Pope & Son Farms in North Carolina. We offer a variety of services from sales and local marketing to purchasing, packaging and financing. Perhaps most importantly, we share our farming expertise; our quality control and shipping teams, our food safety knowledge and staff, and in some cases our farming equipment, warehousing, cooling and ice…. Whatever we can do to help the other succeed. The great thing about having partnerships like these is we all learn something along the way that makes us better individually and as a team. Where are our local farms? We have excellent farming partners in several different growing regions in Mexico and Central America. Their partnership compliments the seasonality of our own farms in the US so that we can ensure that our customers have great quality products all year long. Many of our Mexican partners are multi-generation farming families, including pioneers of new growing technology such as screen house growing and one celebrating 100 years in the farming business. Similar to our local and regional partners, each cares deeply for the land they farm, use US standards for growing techniques, and follow US standard for their food safety programs. Our international partners are part of our growing team, closely connected to our US operations and bring a wealth of knowledge and experience to our offerings.